The Delta HMI interface makes it easy to use the LM-610H Series Machines. Simple hand wheel adjustments make for quick set-up and fast changeover time keeping the machine online with less downtime. Manufactured to (GMP) standards, the LM-610H Series Machines are made of #304 stainless steel and anodized aluminum, and is designed to be used in harsh working environments where other equipment might fail. The Preferred Pack® machine is the right choice for the discriminating buyer. 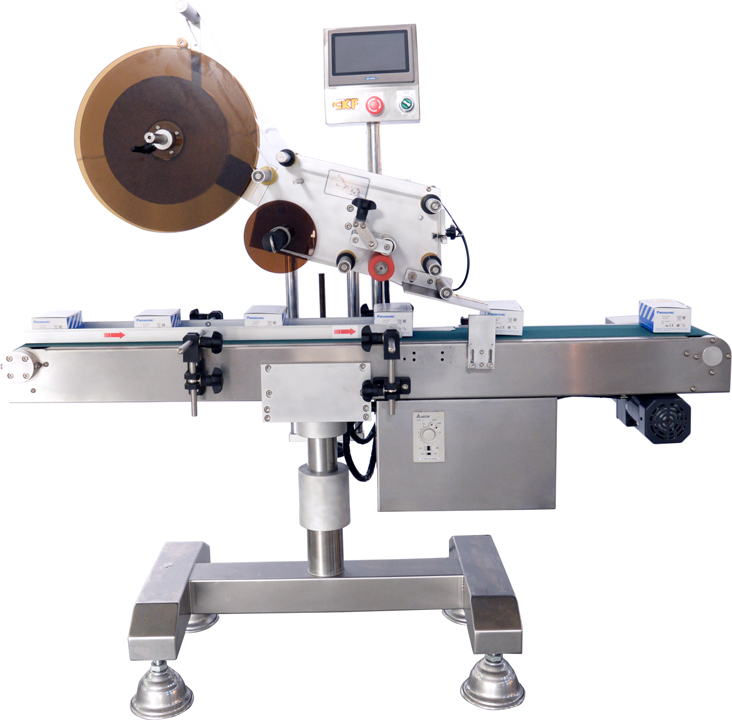 Built into all Preferred Pack® designed labeling machines is a cost eﬀective solution to fast, reliable, pressure-sensitive labeling for apprales, boxes, bags etc. The preset counter means the machine automatically stops once the preset quantity of products has been labeled. The product counter lets you precisely track the amount of labels applied at any point during the production run. The LM-610H Series Machines feature a Delta PLC Touchscreen HMI control system that maintains default settings and memory locations. The digital label adjust position allows the operator to set the desired position of the label to the package with just one touch. The missing label feature locates missing labels on the roll stock, and shuts the machine down if one is found. This ensures each product is labeled correctly. The standard Delta Touchscreen HMI with 83 program memory and label sensors can be easily adjusted for a wide variety of labeling applications. With the digital position setting, your labels are placed accurately on the product every time. The LM-610H Series Machines oﬀer an optional hotstamp ribbon printer which can easily be installed should the need arise. This optional feature lets printers work in sync with the labeler to ensure accurate code placement. Designed to be used for in-line automatic or semiautomatic application. The LM-610H Series Machines comes with casters and can conveniently be moved to other production areas, allowing for changes in production or products. All labelers are made of 304 stainless steel and anodized aluminum. This extremely durable metal is specially treated to guard against rusting and other eﬀects from harsher environments. Height-adjustable conveyor belt makes it easy to match production line heights. • The LM-610H Series Machines’ stepper motor label position setting allows the operator to accurately set the label position, ensuring fast, accurate label delivery. • The LM-610H Series Machines’ controls are all in sync, making sure that all components run at the same speed. All Preferred Pack® labelers are manufactured in compliance with Good Manufacturing Practice (GMP) standards. On/Oﬀ switch and Emergency Stop Switch are prominently located on the main control panel.